The Helix™ Designing System is the latest hair phenomenon to hit the market place. With this system the hairdresser actually cuts curl into your hair. This is done with the Original Helix Shear™, a special scissor that is curved and torqued. When used by a trained Helix graduate the possibilities are endless. What this means for the customer is that a hair design can be cut directly into the hair similar to a sculptor cutting a design into any other medium. With a precision hair cut the hair section is elevated straight up and cut straight across with a straight bladed shear. This actually leaves corners in the haircut. To counterbalance the cut, the hairdresser has to style the finish to fit the round head by back combing, teasing or spraying the cut into place. When the customer goes home and shampoos their hair, the style actually goes down the drain. With the Helix™ Designing System the style is permanently sculpted into the hair so when the hair is shampooed, the design is still there. It doesn’t grow out, just longer. The permanent curl is cut into the hair by twisting the hair in sections and using the Helix™ shear to perform a spiral cut throughout the entire shaft. The result is natural, full volume curl. 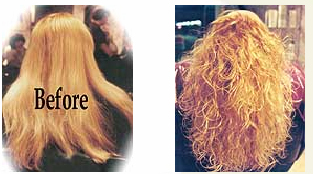 This means that your hair will be more manageable, maintenance is lower and there will be fewer trips to the salon. This technique works on multi-cultural hair for both men and women. Achieve beautiful curls without chemicals! Call Pat or Georgie to schedule a consultation. Helix™ blades are curved and twisted to cut 3-D spirals, or sculpt wedges “C” shapings from ponytail of hair ection. The amount of curl or wave depends on the depth and length of the cutting motion. Carole Lyden Smith, inventor of the famous Helix™ Shears, has personally developed this line of products for Totally Healthy Hair. It was created for maximum performance in any type of hair. This “Tai Chi Hair Care Line” is a prescription product line that may only be prescribed by Helix™ designers for their customers specific needs before and after a Helix™ cut.